Planning the perfect Valentine’s Day is tricky, but when you have some tricks up your sleeves, this is a game that you can win. 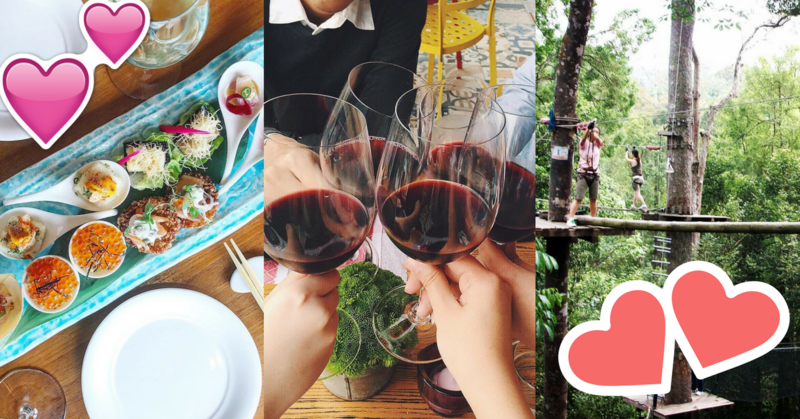 Minus the February clichés such as movie dates and rose bouquets, we are here to chart the best Valentine’s Day itinerary you can do in Kuala Lumpur. One of the best things about waking up late is the joy of savouring a heart-warming brunch. Brunch in Bangsar? Even better! Hit up an all-day breakfast for two at the usual brunch spots such as Antipodean Café, Yeast Bistronomy, and Breakfast Thieves. Seal the deal with some milkshakes from Patissez or creamy desserts from Inside Scoop and Sangkaya. Feeling extra guilty from the milkshakes and ice cream you two just had? Take your bae out to burn those calories because fitness is fun with a partner. If the weather is nice and sunny, head over to Skytrex Adventure or ATV Adventure Park to dirty up those shoes. If you see grey clouds looming, don’t let it be a reason to reach out for another scoop of dessert! Swing by the many indoor theme parks available around the city such as Jump Street Trampoline Parks, District 21, Sunway Pyramid Ice, Breakout Malaysia, and Escape Room. How high can you go at Jump Street Trampoline Park? Now that the constant running and hopping got you two exhausted, escape to a relaxing couple’s spa to recharge. There are plenty of luxurious spas around the city to accommodate you and your tired bae. Make early appointments at Spa Village at the Ritz-Carlton Kuala Lumpur, Swasana Spa at Impiana KLCC, and Hammam Spa at Bangsar Village II for some delightful couple’s spa session. What better way to complement your day in the spa than a day out in the park? A serene stroll in the park is a great way for you and your partner to bond over silly conservations and sweet musings. Kuala Lumpur is filled to the brim with gorgeous parks and that includes KL Bird Park, Butterfly Park Kuala Lumpur, and KLCC Park. If chasing sunsets are your idea of romance, you’ll be surprised to know that Kuala Lumpur has plenty of sunset spots. Just before the sun shies away into the horizon, make your way to the Heli Lounge Bar, Fuego at Troika Sky Dining, and Thirty8 at Grand Hyatt for some of the best views in the city. Never estimate the power of a romantic dinner to set the mood for your entire evening. Wine and dine your significant other with a reservation in top-notch restaurants in Kuala Lumpur. Whether it’s a vibrant Japanese dinner at Nobu KL or a sultry evening at Cantaloupe at Troika Sky Dining and Villa Danieli at Sheraton Imperial KL, you’ll definitely have room for desserts afterward. Imagine spending the last hours of Valentine’s Day with a secret rendezvous in Kuala Lumpur’s famous speakeasy bar. Round up this special day with a refreshing draft beer or a signature cocktail in hidden bars such as PS150, The Vault, and Omakase + Appreciate to rekindle the best moments of the day.